Response in full from Cyprus Wine Fair organisers, newspaper Parikiaki on Bloody Map that was displayed at their recent event. Firstly, I would like to thank T-VINE Magazine for giving us the opportunity to comment on your article regarding the Cypriot Wine Festival & Business Expo (CyWineFest). Parikiaki newspaper is the main organiser of the festival which began more than three decades ago as a bazaar and today is one of the biggest events organised by Cypriots outside Cyprus. Since our establishment and to this day, Parikiaki is a serious Cypriot progressive weekly newspaper, mainly in the Greek language and includes a smaller English section. As a result, the majority of our readers are Greek Cypriot. Over the years, CyWineFest has attracted exhibitors from all forms of life; English, Greek & Turkish Cypriot, and Turkish firms – after all, we live in London, a multicultural society. Obviously, the majority of exhibitors are Greek Cypriot. This year for example, among others, we had a stand which was selling tickets for the Greek & Turkish Cypriot Expatriates Friendship Week, which took place a week after our festival with great success. We at Parikiaki are proud to say that the organisation of the festival relies heavily on volunteers from which some are Turkish Cypriots. Parikiaki has always held a clear position supporting the rapprochement and peaceful coexistence between the two main communities in our homeland which is why, at all of our events, we encourage and always have Turkish Cypriots participating. At the same time, we hold a crystal-clear position that since 1974, there is an ongoing crime taking place in Cyprus – the illegal Turkish occupation of more than 1/3 of the island. An occupation that resulted in more than 200.000 refugees, thousands of dead, and missing persons from both communities. We also know and recognise that before 1974, bicommunal crimes had taken place from both communities by fascist organisations. The map that you are referring to represents the pain, the thousands of deaths and bloodshed that Turkey’s invasion inflicted on Cyprus; crime that continues to this day. It has nothing to do with our Turkish Cypriot compatriots who we believe are suffering the same. In general, we are fighting against racism and inciting racial hatred, and we paid a “price” for this many times in the past. But this has nothing to do with racism. It is clearly a political and humanitarian issue which all progressive Cypriots from both communities are fighting. Our objective is to find a just and viable solution, based on a bi-zonal, bi-communal federation and on UN Resolutions. In addition, the stand where the map was located was the Organisation of Relatives of Missing Cypriots, whose committee members are both Greek and Turkish Cypriots. I would like to conclude by saying that we will continue with all of our power, together with Greek and Turkish Cypriots, to find a way to reunite our island and build a peaceful common future away from the mistakes of the past, from nationalism and chauvinism from both communities. Parikiaki, by its actions in the Cyprus Wine Festival is not helping any reconciliation attempts between the two communities – rather the opposite. They are carrying the political and biased Greek Cypriot propaganda onto UK soil and in doing so dividing two communities which have lived in peace here in UK so far. We condemn their action. We as the British Turkish Cypriot Association would like to put it on record that the “Bloody Map” that has been displayed at the Wine Festival organised by Parikiaki newspaper is very offensive to Turkish Cypriots. It is bordering on inciting racial hatred and intolerance. We as the BTCA will write a letter to both Enfield and Haringey Councils demanding why such hate inciting elements are allowed to be displayed in a Wine Festival, especially given the large number of Turkish speaking people living in the area. We are disappointed that none of the councillors of the two councils with a Turkish background have taken up this inappropriate and inexcusable act by the organisers of the festival. By definition such festivals are meant to bring people together and not to divide them with political statements. We feel Parikiaki has done a great disservice in that respect to the people of the local area, as well as those of Cypriot origin. Although Parikiaki states that it sees Turkey’s 20th July 1974 intervention as “an invasion”, the overwhelming majority of Turkish Cypriots see it as a liberation from an unjust and brutal Greek Cypriot regime that had denied Turkish Cypriots their human rights, as well as their political rights under the 1960 Cyprus Independence Treaty, by forcing them into ghettoes and attempting genocide. Unfortunately, the newspaper editor and event organisers seem to have a selective memory about the Cyprus Conflict that for them started in 1974. They completely ignore the mass graves where dozens of innocent Turkish Cypriots were murdered and buried by Greek Cypriots. Parikiaki proclaiming it is “progressive” and that they represent Turkish and Greek Cypriots especially on the missing persons issue is also at odds with the reality they presented at the festival. 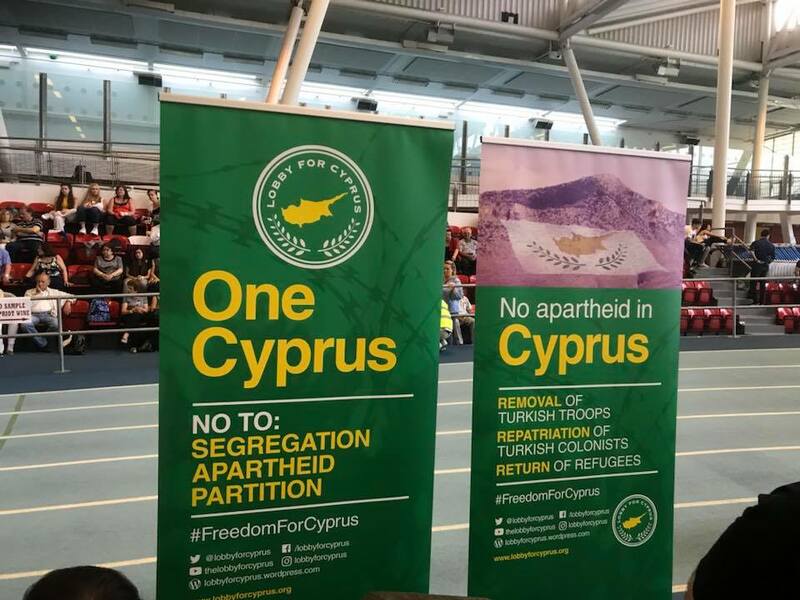 Not only do they permit hate material against Turks to be freely distributed, but they also failed to display even one Turkish Cypriot’s picture on the Missing Persons banner, showing total bias against and insensitivity to Turkish Cypriots. Main photo © Alp Ermiya, taken at the Cyprus Wine Festival at Lee Valley Athletics Centre, North London, 27 May 2018.